The term “Ammunition” means ammunition or cartridge cases, primers, bullets, or propellant powder designed for use in any firearm. A full jacketed projectile larger than .22 caliber designed and intended for use in a handgun and whose jacket has a weight of more than 25 percent of the total weight of the projectile. 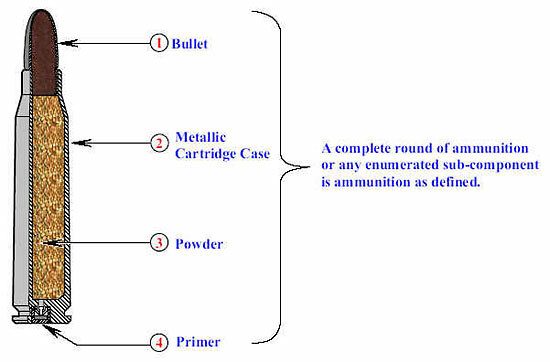 The term “armor piercing ammunition” does not include shotgun shot required by Federal or State environmental or game regulations for hunting purposes, a frangible projectile designed for target shooting, a projectile which the Attorney General finds is primarily intended to be used for sporting purposes, or any other projectile or projectile core which the Attorney General finds is intended to be used for industrial purposes, including a charge used in an oil and gas well perforating device.